It should come as no surprise to anyone familiar with the Rocky franchise that even when he is playing a prisoner, Sylvester Stallone is still a nice guy. When the corrupt cops in his neighborhood looked the other way after his beloved mentor was attacked, Stallone's Frank Leone roughed up the hoodlums responsible leading to time behind bars for aggravated assault. Now with just six weeks left on his sentence which became extended when he broke out of an abusive institution to visit the dying man and the politicians sided with Leone versus the vicious Warden Drumgoole (Donald Sutherland), our unlikely jailbird hero becomes the victim of revenge himself. Shortly into Lock Up, Drumgoole abuses his power to have Leone transferred from the white collar style jail Leone had been in to the Shawshank style Lord of the Flies hellhole to which Drumgoole was assigned following the scandal that ensued back when he'd denied Leone the opportunity to pay his deathbed respects with a mere week to go on his term. Determined to break him to the point of either death or ensuring that Leone will have to spend the rest of his life in the big house to make up for his professional demotion and embarrassment, the sadistically egomaniacal Drumgoole relishes in monopolizing on the morally flexible nature of both his prison guards and his inmates with escalating attacks on Leone's physical, emotional and mental well-being. Even though it's hardly memorable, Lock Up earns bonus points for the fact that it doesn't seem to set out to become a prison exploitation movie, instead giving off the impression that is filmmakers were aiming for a cross between a 1930s Warner Brothers social realist portrait like I Was a Fugitive From a Chain Gang and the Paul Newman classic Cool Hand Luke. And true to the genre convention, Stallone befriend three other inmates including the scheming Dallas (Tom Sizemore), fellow mechanic enthusiast Eclipse (Frank McRae) and the young First Base (Larry Romano), whom he takes under his wing, schooling him in on his belief in DTA-- Don't Trust Anybody – which ironically he breaks as soon as he says it. 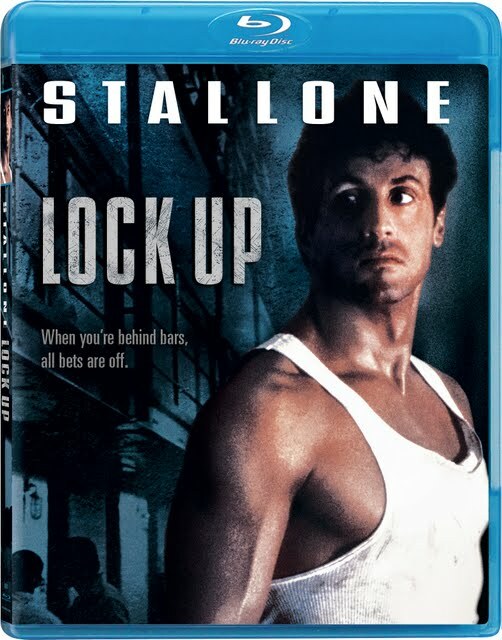 But despite Stallone's easily relatable and empathetic performance, Lock Up loses its direction about midway into the film with a a series of predictably dubious “inciting incidents” designed to test Leone's mettle until he's forced to act. Unfortunately, this transpires in an insanely over-the-top action movie confrontation that unfortunately derails the work completely with a ludicrous sequence that's somehow ignored and resolved quick enough for the protracted happy ending. Director John Flynn's 1989 Razzie nominated effort was released on Blu-ray by Lionsgate and Studio Canal to tie in with their recent collector's edition set of all four Rambo films on high definition and build up anticipation for Stallone's upcoming work The Expendables. And while it's doubtful that you'll want to add this grim, gritty and ultimately mediocre work to your movie library also considering the fact that the DTS HD sound is the only particular Blu-ray standout, it's fascinating enough to view once if only to see Stallone attempt to play a different variation of his timeless nice guy.